The search for a new mattress can be complicated. So, I’ve put together a list of the best memory foam mattresses in 2018 to make things easy. Quality sleep is one of the most important factors for good health – but around 1 in 3 people suffer from insomnia, and an uncomfortable mattress doesn’t help! Memory foam could be the game changer you need. Take a look at our reviews below. I found this mattress to be super unique, as it uses green tea extract to maintain the memory foam’s freshness (and let’s be honest, the whole “green tea” concept adds a little extra “zen” as well!). Once it arrived, I unpacked the mattress from the box and allowed it to inflate for about 30 hours. There was a slight odor as I unpacked and inflated the mattress, but it wasn’t nearly as strong as others I’ve tried (although this was a bit difficult to get out of the box). Laying on this mattress feels like there’s a bit of an extra dimension to a traditional memory foam mattress, with a nice squishy top layer of foam. This top part conforms to your body, while the next layer of memory foam supports on a deeper level. Overall, I would consider this to be a firm memory foam mattress, but with a nice give to the upper layer. It still feels soft, but with an underlying support that’s great for side and back sleepers. Both firmness and softness – a firm memory foam provides support and contouring for your body, but the squishy top layer adds a soft quality that’s missing from many firm mattresses. The Green Tea mattress would work well for both firm and soft mattress lovers. Lightweight and inexpensive – a relatively low investment, this mattress is light and easy to transport. The quality of foam and material is great for the low price, and it comes with a 10-year warranty just in case. Great for side and back sleepers – the foam in this mattress definitely doesn’t feel bouncy at all, but will give a side or back sleeper a good night’s rest. Ease of delivery – I was shocked at the speed of delivery, and the small size of the box this mattress came delivered in! Definitely convenient and an easy mattress to move around the house. Didn’t quite inflate fully – I bought the 8″ mattress, but I’m pretty sure it’s not fully inflated to that full size. Still very comfortable and a great night’s sleep, but I’d love to see the mattress expand to its advertised size. Not great for stomach sleepers – my husband loves to sleep on his belly, so he generally needs a mattress with a bit more give. He wasn’t a huge fan of the overall firmness of this one. Tends to hold heat – one thing I notice about some memory foam mattresses is that they can tend to be really hot! This Green Tea mattress isn’t terrible, but there were a few nights I felt a bit uncomfortably warm on the side of my body touching the mattress. As someone who’s a sucker for anything “zen” and calming, I was initially attracted to the unique Green Tea aspect of this mattress – and in the end, was really happy with the sleep I had on it. You’re definitely buying a cheaper mattress here, so don’t expect the most dream-like experience ever, but for the price, it’s definitely a great pick in the memory foam department. While the green tea didn’t seem to make a huge difference in the experience of the mattress, I love the concept and my sleep was fine. Good mix of firm and soft. Lightweight and easy on the wallet. Great if you sleep on your side or your back. Quick delivery and easy to move around the house. Didn’t expand to its advertised size. Tends to warm up a bit at times. Taking it up a price point, the Tuft & Needle is a good, high quality mattress that I found to be a good balance between soft and firm. It would be a great pick for couples who can’t seem to ever compromise on a mattress they both love. The founders apparently created this mattress with the intention of providing a high-quality sleeping experience without the thousands of dollars price tag. You really can feel the difference compared to the $100-200 mattresses. This one doesn’t get hot like cheaper memory foam, and it really does a great job of supporting your body while still keeping a comfortable softness in the top layer. It’s got a nice combination of bounciness, cushiness, and support that I didn’t find in some of the other mattresses. They have a great return policy and a 100-day free trial, which is awesome since you often don’t know if you love a mattress until you’ve slept on it for a few months! Doesn’t get hot – oftentimes, I feel way too warm when sleeping on a memory foam mattress. Something about all that foam must just hold in heat… But this Tuft & Needle mattress didn’t seem to have that problem – I felt comfortable all night. You really can’t feel movement – true to the intention of a memory foam mattress, I couldn’t feel my husband moving around on the other side of the bed, or even notice when he got out of bed in the morning. 100 night free trial – great, right? You can try this mattress out for 100 whole nights for free, and if you don’t like it, just return it for your money back. That really feels like long enough to see if it consistently delivers a great night’s sleep. Good soft/hard hybrid – my husband loves a super firm mattress, while I need a bit of softness to feel comfortable. We both agreed that this one offered the best of both worlds. Difficult to return – if you do want to return this mattress, it’s not exactly the easiest thing to do. You’ll need to box it up yourself before returning to Amazon, but the problem is that the mattress is vacuum packed when it arrives, so you have to figure out a way to box it up in its fully inflated form – a real pain. Left me with some soreness – after a few weeks of sleeping on this mattress, I started to feel soreness in my neck and shoulders. Because I had never experienced this before, I can only assume it was the change in mattress that caused these problems. Apparently it takes two weeks for the mattress to reach its peak softness, so that may have contributed to the issue in those first few weeks. Expensive – personally, I feel that I paid a bit too much for this mattress, considering that it left me in pain after my first few weeks using it. However, my husband loves it and feels that it was a great investment, so it really just may be a matter of opinion. If you’re looking for a mid-range mattress that can appeal to those who like both a soft and firm mattress, this one might be a good choice for you. I do love the trial policy and customer service, as this is a small company that’s clearly aiming to provide a great experience for their customers. Doesn’t get hot. Easy to sleep through the night without waking up warm. True memory foam experience: you can’t feel movement. No risk: 100-night free trial. Could take a few weeks for the mattress to reach peak softness, leaving you a bit sore in the meantime. This 12-inch mattress is a bit thicker than what I normally go for, but I was open for the new experience. They use two different layers of foam: a top 2.5 inch layer of softer memory foam on top, and a deeper 9.5 inch layer of support foam. Because I tend to have mild back problems when sleeping on the wrong kind of mattress, I was excited to try this one out, as it promised full pressure point support and to help your body maintain proper alignment when sleeping. Great pressure point relief – if you’re someone who tends to have sore pressure points, this mattress offers great support. I felt like my body was well-supported all night, and I woke up feeling fresh, not in any pain at all. Good value for price – for a low-mid range priced mattress, this one checks most of the boxes. I could definitely see using this on my bed for quite a while. Nice shaping to the body – with this mattress, I really felt like it contoured nicely to my body and cuddled me in! I love feeling both supported by memory foam, and feeling a nice softness that I can sink into. This mattress delivered the best of both. Good size – even though it was a standard queen-sized mattress, both my husband and I agreed that this mattress had a more spacious feel to it than other queens we’ve tried. Maybe it was the extra depth, but this mattress just felt like it supported both of us better than some others. A bit too firm – while I definitely enjoyed my sleeping experience on this mattress, it was a bit too firm for my liking. I’d love to have felt a bit more softness in that top layer of memory foam. It is possible that the mattress softens up more with time as well. Heavy – once inflated, the mattress is super heavy, which would make it extremely difficult if you wanted to move it around the house later to a different room. The box it comes in is massively heavy as well. Warm – this was another memory foam mattress that we noticed tended to hold heat (you might notice this complaint in other mattress reviews as well). Not a huge deal, but it would be nice not to wake up in the middle of the night and have to throw off the blankets or turn on the A/C. Intense odor when inflating – I always feel a bit concerned when I smell that awful odor when the mattress inflates – is it going to be toxic? But the smell died down completely after the mattress was completely inflated to its full size in 24 hours. I enjoy the Shiloh Mattress by Sleep Innovations, and had some really great nights of sleep on this one. My favorite thing about this mattress is how it really cradles my body and supports my pressure points even when I toss and turn. I’m not a huge fan of how heavy it is, so it could be a pain to transport around. Overall though, functionally it does a great job for the price. Great support for your pressure points. Contours nicely to your body. Extra depth makes it feel more spacious. Top layer is a bit firm. Foul odor when the mattress inflates, but it goes away quickly. Moving on to a new kind of memory foam: gel! What distinguishes this mattress is its SleepCool technology that uses a new memory foam material to keep the mattress cool, and air circulating so you don’t wake up feeling so hot in the middle of the night. The 12″ mattress has 3 layers of foam, so let’s break it down: a 3″ layer of gel memory foam on top, followed by a 2″ layer of Art Cool Airflow Foam, and 5″ of density foam at the bottom for the foundation of support. The mattress arrived in a tall box, inside several layers of vacuum-sealed plastic. After cutting the plastic away, my husband and I unrolled the mattress and let it inflate on the bed. I’d say after 4-5 hours it was already about 11 inches thick, and fully expanded to its full capacity within the next 12 hours. Dense, high-quality – while at first I thought this mattress might be too firm, I started sinking into the foam and realized that the many layers really increase the quality of this mattress. It’s multi-layered, so the initial firmness is coupled with a deep softness that just feels divine on your body! Free pillows included – they throw in a few memory foam pillows (which aren’t cheap bought on their own!) While I personally don’t prefer to use these pillows for sleeping (I have my own that I’m pretty picky about using! ), it’s great to have some extras on hand for the sofa or for guests. Cooling technology – the part we were most excited about trying out with this mattress was the cooling technology, which supposedly would prevent the memory foam from retaining heat. Overall, I would say that this mattress felt cooler than the other memory foams we’ve tried – so cooling technology for the win. Gel foam feels soft yet supportive – one of my favorite things about this mattress is the use of an innovative material to create a supportive and yet soft and comfortable feel. The gel kept us cool and had a more multi-layered feeling than some of the other memory foam mattresses we tried. Could be a bit too firm – personally, as a softer mattress lover, I was hoping for this gel foam mattress to be a bit softer than it was. It did feel too firm for my liking, and I tossed and turned around a bit the first few nights trying to get comfortable. My firm mattress-loving husband, on the other hand, found it perfect for his liking. Can develop dips – over time, this mattress can tend to develop dips and ridges in the memory foam, which is unfortunate as memory foam mattresses can’t be flipped to the other side. There’s no guarantee it will happen, but it’s been known to be a problem with this model. Super heavy if you want to return – I’d make sure you’re clear you want to keep this mattress, because it’s mind-boggling to imagine getting this back in its original packaging. It would probably cost several hundred dollars to get this 125-pound mattress shipped back – let alone the hassle of getting it in the box. The Dynasty Cool Breeze uses an innovative gel memory foam to create a cooler mattress with good support and airflow. While the quality of sleep I got didn’t blow me out of the water, it was definitely a solid contender in its price range. If you tend to get hot on other memory foam mattresses, this one might be a good choice for you. Added density for extra comfort. Gel foam for extra support. Very bulky and tough to return. The DreamFoam Mattress is a thick mattress at 13″, perfect for those who crave extra support and a deep level of both firmness and softness. It’s made up of 3″ of 4-lb gel memory foam, an innovative technology that helps provide extra softness at the top along with keeping the mattress cool. Underneath that layer is 2″ of 5-lb memory foam, and at the very bottom is an 8″ base of premium foam that serves as the foundation for the mattress. The design of this mattress is intended to emulate more expensive mattresses like the Cloude Luxe, but at a fraction of the cost. It’s great if you’re looking to save some money, but still get a great mattress that will support your sleep. The gel memory foam in the top layer is intended to really conform to your individual body, and provide unique support to each person sleeping on the bed. The gel actually also helps your body to maintain its temperature, so you don’t wake up feeling too hot or too cold. Extra thickness – for me, the extra thickness of this mattress was a great thing. I haven’t used a mattress this thick before, but it provided exactly the support and comfort that I had been looking for. For the price, I really feel like this offered a great quality and comfort that I haven’t found in another mattress of its type. Keeps you cool – the gel in the top layer of this memory foam really did a great job of maintaining body temperature and keeping us cool – even more so than the mattress that used the specific cooling technology. Cumbersome – the thickness of this mattress is great for sleeping, but it makes it very unwieldy and difficult to move around the house if you want to move rooms for some reason. A bit short on width – this wasn’t a huge deal, but I noticed that the mattress didn’t quite fit into our queen box frame. There’s a chance that our frame is on the large side, but I haven’t had this problem with other mattresses. It would be nice if the mattress would fit perfectly into our box frame. Could be bad for back sleepers – I slept great on my side on this mattress. But when I slept on my back, I woke up a few times with neck problems. Not sure if it was specifically because of the mattress, but it was something I noticed after a few nights on this bed. Overall, I would really recommend this mattress for people looking for mid-priced memory foam that delivers on both comfort and support. There really isn’t much bad to say about this mattress, and I will try back-sleeping on it a few more times to see if that soreness was a fluke. Well-made, well-priced, and a good investment. Extra thickness = more support. The mattress stays cool so no night sweats! Tough to move around the house. A bit short on the width. Might not be good for back sleepers. The Leesa Mattress is understated but powerful! It combines a solid foundational core base layer with memory foam in the middle for combined support and flexibility, and a top layer of Avena foam that’s cooling and bouncy. This mattress is best for all body types, and would be especially great for a couple who has different needs when it comes to their mattress, as it can deliver in many areas. One cool aspect of this mattress is that for every ten they sell, they donate one mattress to a local shelter. It’s great to see a mattress company that’s socially active and cares about bigger issues as well as selling more mattresses. With three comfy layers, the mattress feels like a nice blend of supportive and cushy. The top layer in particular impressed me, with 2″ of perforated foam that allows air to flow through. While this aerated approach was a good idea, however, I did end up feeling a bit warm when sleeping on this mattress. Conforms well to your body – despite its firmness, I really liked how this mattress conformed well to my body. I really felt like I could sleep all night in one position and not have to move. The depth of support is really there, and the cushiness seems to come in after you’ve settled into one position. Conveniently sized – unlike some of the other mattresses, this one came in a smaller box that was easier to maneuver. It was easy to get the mattress out and unpacked so we could inflate it. 100-day trial – it’s always great when you get the chance to try a mattress out before committing to it. This one has a 100-day trial so you can really give it a good try and see how it feels to sleep on it for multiple months. Takes some time to adjust – to be honest, the first few nights we slept on this mattress, both my husband and I woke up in pain with some soreness in our backs and shoulders! But we had read reviews that said to stick it out, and after a few days, the pain went away and we had great nights of sleep. A bit too firm – even after the mattress initially softened up, I still find it too firm for my liking. It would be great for people who really want a firm memory foam mattress without that extra super cushy bit at the top. On the hot side – like many memory foam mattresses, this one tended to hold heat. Even though this mattress didn’t have quite the right combination of softness and firmness that I personally prefer, I feel like it’s a powerful mattress for the price. The quality of foam just feels high, and I get the sense this mattress would last a long time. My husband and I could each be moving around on the bed and not be disturbed by the movement of the other. If you want a well-priced, high-quality mattress that’s half the cost of many other memory foams, this could be a good bet. Conforms well to the body for extra support. Could be a bit too firm if you like soft mattresses. As a lover of anything natural and sustainable, I was particularly looking forward to trying out the Brentwood mattress with a bamboo cover. We tried the 13-inch queen size, which is made in the USA but has a cover lined with New Zealand wool, which is supposed to keep moisture out and reduce any odors. The 13 inches of foam are broken down as follows: 3.5″ of gel memory foam on the top, followed by 2″ of ventilated AirFlow Foam, then 7.5″ of base foam on the bottom. The top layer of foam conforms to your body and isolates movement so you won’t feel your partner’s movements at night, while the middle layer keeps the mattress cool (so you don’t feel that typical hot feeling with memory foam mattresses.) Finally, the base layer provides that solid foundation, absorbing your weight and supporting you on a deeper level. The bamboo cover is especially nice on this mattress, as it’s totally toxin-free (not sure I can say that for the others!) and is easy to take off, wash, and replace. Healthy materials – I love how the cover of this mattress is made with sustainable bamboo, and the company really puts an emphasis on sourcing healthy, non-toxic materials like flame retardants and other chemicals. Really important when this is something we’re sleeping on every night! Foam allows you to move freely – one thing I noticed about this mattress was how I could move around as needed during the night without feeling the “quicksand” effect of many other memory foam mattresses. 25-year warranty – they have a great warranty on this mattress, which shows me that the company really stands behind its quality and long-term durability. If there’s any premature sagging, you’re protected. Great for a long night’s sleep – I’m not sure why, but my husband and I slept especially long nights on this mattress! It really conformed to our body shape and supported us in getting a particularly deep sleep, which was much appreciated! Softer than expected – this mattress actually sagged a bit more than we expected when we first tried it out! Now, I’m generally a fan of softer mattresses in general, but my husband wasn’t a huge fan of this one, as he prefers firmer support. Odor when inflating – I was a bit confused why this mattress smelled so bad when we were inflating it, considering that they supposedly don’t use toxic materials. Whatever the reason, you’ll want to inflate it in a separate room as the odor is quite unpleasant and strong at first. This mattress fits well in the mid-price range, and would work well for people who are conscious about using healthy materials. It’s also softer than most other firm memory foam mattresses in its class, so it would be good for someone who prefers a more cushy feeling. Made from healthy, non-toxic materials. Allows you to change sleep positions with ease. The conforming design allows for a full night’s sleep. Softer than you might think. Probably not the best choice if you like firm mattresses. Strong odor at first when you inflate, but it goes away. The 10″ Sleep Innovations Shea Memory Foam mattress is slightly smaller than some of the other mattresses we tried, but promised to provide a fantastic cradling support perfect for back and side sleepers. This mattress is comprised of just 2 layers: a 3″ top layer of SureTemp Memory Foam, and a base of 7″ Support Form as the bottom foundation. While I initially thought this mattress would be inferior to those with 3 layers, I was wrong: the two layers did a great job of supporting and cradling my body, and ensuring I had a solid night’s sleep. What I found was that it was firmer than I expected, and really holds your body in one place during the night. So for people who want to just settle in and find that one position to sleep in, this would be a great option. Personally, I love a mattress that lets me roll around a bit to find the perfect position, so this wasn’t ideal for that. Excellent price – for the quality, I found the price of this mattress to be very reasonable. It’s really one of the best memory foam mattresses in this price range. Comfortable top layer – I really did love the top cushy layer of this mattress. Even though the mattress as a whole felt quite firm, the top layer has a wonderful soft cush to it that cradled my body just as I like. You sink down deeply – if you’re someone who really wants to sink down into your mattress when you’re sleeping, the Sleep Innovations might be a great choice. It really allows you to sink in and stay positioned in one place during the night, supporting pressure points along your spine. No motion transfer – I literally didn’t feel my husband move in the night at all – although maybe that’s because he was sunk down deeply, unable to move! One side kept popping up – this may have just been a problem as the mattress was recently inflated, but it had this annoying habit of popping up on one side/corner. I would love to see it lie flat in the bed frame, rather than popping up awkwardly. Queen sheets didn’t quite fit – the queen sheets we had weren’t quite big enough for this mattress. Not sure why we had just a few small problems with fit, but we had to purchase deep pocket queen sheets for this one. Hard to move around – while the lack of motion transfer is a great quality, I found it too difficult to move around during the night if I needed to change positions. It’s nice to be able to sink in deeply and not move, but this just wasn’t my personal preference for a mattress. Overall, I think this mattress could be great if you’re looking to really sink in and not move during the night. It has a nice firm quality, but a cushy top layer that really wraps around your body. Delivery and unpacking were super easy, and it was easy to transport to our bedroom. If you like a firm mattress with a soft top, give this mattress a go. Top layer is extra cushy and comfortable. Sink deep for a good night’s sleep. Extra pressure point support for pain relief. One side kept popping up. “Queen” size is a bit misleading. Our sheets didn’t fit. Since you sink deeply, it’s hard to change sleep positions. Always interested in “alternative” products, I ordered the Lucid Bamboo Charcoal infused memory foam mattress, to see what differences the bamboo charcoal would make to the sleeping experience. This mattress is a deep 14″, with an impressive four layers of foam making up the mattress. The top layer is 1″ of bamboo charcoal memory foam, which I’ll explain more about in a minute. Next we have 3″ of gel memory foam, followed by 2″ of natural latex foam, and a bottom layer of 10″ of high density support foam. All of that makes an extremely supportive and richly-layered mattress! Now, about this bamboo charcoal. This material is used because it is supposedly good for sensitive skin and thermal regulation – meaning we shouldn’t feel so hot during the night. Personally, I didn’t notice much difference between this mattress and others that used different materials, but then again, I’m not particularly prone to skin issues. Overall, the experience of this mattress provided a great night’s sleep for both my husband and I. While thicker than most mattresses we would normally try, it was a very pleasurable sleeping experience. 4-layers of memory foam – I really like how they incorporate 4 different layers to make this mattress uniquely supportive. The use of bamboo charcoal is an interesting alternative way to provide cooling and relieve problems for people who have sensitive skin. Stays cool – we didn’t feel any warmer than we normally do – two thumbs up for bamboo charcoal! Nice combo of soft and firm – with 4 layers, you would only expect this mattress to feel at least a bit soft! The top layers really sink into your body and feel like a marshmallow, while the bottom layers provide that support you want in a memory foam mattress. Felt a bit of soreness in hips – I’m not sure if the mattress was a bit too soft for some areas of my body? But I woke up after a few nights feeling some soreness in my hip area. It could have also been attributed to other factors, but just thought it was worth mentioning. Took a while to expand – we were excited to try this mattress out, but it actually took a bit longer than the others to inflate. We had to wait about 35 hours for the mattress to reach its full size. But this may be to be expected, considering that this one is 14″. Slight odor on inflation – not a huge deal, but the mattress didn’t smell very good when it was inflating. I personally enjoyed this mattress a lot, and had a great night’s sleep despite feeling a bit sore in the hip area in the morning. My husband slept like a baby, and we both agreed that the bamboo charcoal really helped out with the heat problem. Overall, this was one of the best memory foam mattresses for maintaining and regulating temperature. We both felt a comfortable temperature all night, and didn’t toss and turn at all. 4 layers of memory form for unrivaled support. Bamboo charcoal keeps you cool. Soft for a good night’s sleep, firm when needed. Might be too soft for full support for some body types. Took more than a day to reach its full size. This 12″ Signature Sleep mattress initially attracted me because of its use of non-toxic materials. They promise that their mattress is free from toxic substances like flame retardants, mercury, formaldehyde, and heavy metals. The mattress itself is made up of 2 foam layers: a top 3.5″ layer of Memory Foam, and a bottom 8.5″ layer of high density foam for foundational support. This mattress arrived differently than some of the others – it came in a duffle-like bag that we simply opened up and unwrapped the rolled-up mattress. One great thing was that there wasn’t much of an odor as this mattress inflated! Bonus points! Eco-friendly materials – it’s so important to make sure that what’s in your home and on your body isn’t full of toxic chemicals. This mattress proudly uses non-toxic, eco-friendly materials that keep your house and health safe. Super supportive – I’d have to say that this mattress provided some of the best support I felt from any of these mattresses. It really was a great combo of soft on the top so I could sink in, but still firm enough that I could move around if needed. And I never woke up feeling sore anywhere. No odor when unrolling and inflating – It was a super bonus to know that there were no toxic fumes entering our home, since this mattress is eco-friendly. We didn’t have to deal with any of the chemical smells from some of the other mattresses. Took ages to inflate – this mattress took the longest of all of them to inflate. I’m not sure if it was because the mattress is made of eco-friendly materials, but it took nearly 3 days to reach its full capacity. Could be too firm – for some people, this mattress might feel a bit too firm. It does feel different than some of the other mattresses, with a bit less give to the top layer. So if you really love that traditional cush of the top layer of memory foam, you might find this to be a bit different. Late delivery – this may have just been our personal experience, but the mattress was delivered a day later than expected. Not a huge deal, just something to note. If you’re someone who really values eco-friendly products, this mattress may be the choice for you. It’s really fantastic to know you’re not toxifying your home or body with terrible chemicals that are in most household items. The eco-friendly materials feel nearly identical to most of the other memory foam mattresses we tried. The one difference was that the top layer wasn’t quite as pleasantly squishy as the other mattresses. However, if you enjoy more of a firm feel, this could be the mattress for you. Extremely comfortable but still supportive. Might be too firm if you prefer soft mattresses. Delivery was late (could just be unlucky). Have you been tossing and turning all night, unable to get a full night of sleep? Do you wake up feeling groggy, like all you want to do is turn over and close your eyes for another hour or two, despite the laundry list of things you have to do in the morning? I was there, and I knew it was because of our mattress. Chances are, your mattress could be impeding on your quality of sleep, which then negatively impacts your quality of life. Luckily, purchasing a new mattress is a quick and easy way to make a change for the better. However, there are literally thousands of mattresses out there, and the choice can be overwhelming. In fact, it can be so difficult to decide, that many people just opt to stick with the (bad) mattress they have, rather than go through all the trouble to understand what makes a good one. This guide will help you understand what’s important to know when buying a new mattress, and how to recognize when you find it. Mattress shopping is notoriously complicated, because there are so many factors that go into the process. First of all, there aren’t just two options of “soft” and “firm”. There is an endless grey area of mattress firmness levels that can be mind-boggling, especially if you aren’t really sure what you personally prefer. Next, it can be difficult to select the right mattress if you have a partner who prefers a different kind of mattress than you do. How can you find one mattress to satisfy two different needs? Finally, there are so many different textures and materials used: from traditional box-spring mattresses to memory foam, and all of the different materials used in each. The truth about memory foam is that the benefit lies in the design. The problem for most people is that when they sleep, their mattresses don’t distribute weight evenly. This throws your body out of alignment and leads to restless nights and groggy mornings. This NASA-designed material actually conforms to your body’s contours, supporting alignment and evenly distributing weight so that you get a deep night’s rest. Your heavier body parts like your hips will sink deeper while body parts that don’t protrude will be kept more even. Another cool benefit that I love is that memory foam absorbs movement, meaning your partner will get a better night’s rest too if you tend to dance everywhere when you sleep. There’s a reason why you can find this stuff in everything from mattresses to pillows and even dog beds. It really works. Support – you want your new mattress to support your body, especially in any areas that you tend to feel pain or soreness. You want to have your body maintain its proper alignment when sleeping. Comfort – it goes without saying that your new mattress should be comfortable! The perfect mattress strikes that ideal balance between supportive and comfortable. Motion separation – this just means that you don’t feel when your partner moves on the bed. Have you ever seen those TV commercials where someone is jumping on one side of their mattress while a glass of red wine sits on the other side (without spilling?). That’s motion separation. 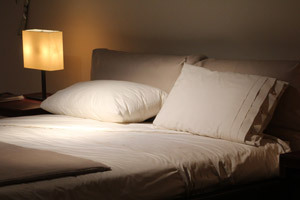 Temperature – some mattresses tend to hold heat, and make you feel uncomfortably warm during the night. Ideally, the surface of your bed should be the same as your skin temperature, so you don’t end up feeling too hot or too cold. Edge support – a good mattress will keep you from feeling like you’re going to roll right off the bed! This means that the mattress will have extra support around the edges, and not dip in these areas. Test it out physically if you can. If you go shopping in the store, physically get on the mattress and try it out! And if you buy online, go for a mattress that has a trial period so you can give it a try and return it if it doesn’t work for you. Check the return policy. If your new mattress doesn’t have a free trial period, you’ll want to be aware of the return policy. Oftentimes, you won’t notice the effects of a mattress until several weeks have gone by of sleeping on it. So make sure you’ll have enough time to really sleep on it, then have the ability to return it if there are any problems. Know your warranty. Similar to the return policy, you’ll want to make sure your mattress has a good warranty that’s at least 5 years. Poor quality mattresses tend to degrade more quickly, so you’ll want some assurance that the one you’re purchasing will last the test of time. $90-500 – at this price range, you can get an affordable mattress that will save you money, but may have less durable construction. Don’t expect this type of mattress to last you for 25 years. They may also have less features than some of the more expensive mattresses. $500-$2000 – a mid-range priced mattress will last you longer than a cheaper one, and will come with more features and benefits. It’s not going to be the top top of the line, but you can definitely expect this mattress to last for many years. $2000 – and up If you want a mattress that will give you the top of the line features and last as long as you want it to, then prepare to shell out the big bucks. It can be worth it though, as you’ll have an amazing night’s sleep for years to come. It’s really up to you how much you want to spend on your new mattress. Getting a quality night’s sleep is incredibly important for your health, so just keep that in mind when deciding on an amount of money to invest in a new mattress. Is shipping/delivery included in the cost of your mattress? Since a mattress is such a massive item, you want to make sure that shipping and delivery are included! You definitely don’t want to have to pay for that. A good mattress company will offer to deliver it to your door at no extra cost. Will they dispose of my old mattress for me? An extra bonus is when the mattress company will help you take care of your old one. Many will even offer to recycle your mattress for you at no extra cost. How long will delivery take? There’s nothing worse than finding the perfect new mattress, only to find out that delivery will take a few weeks! Find out how long it will take to arrive – it shouldn’t be more than a week. In the end, memory foam is a safe bet to help you get that elusive good night’s rest you’ve been dying for, but finding the right mattress that’s a perfect fit for you could be a bit challenging. With endless varieties of materials, levels of thickness and support, and extra perks to boot, all you’ve got to do is pick the right one. I hope this list of the 10 best memory foam mattresses helps you finally catch 40 quality winks every night.